B&W 683 S2 review | What Hi-Fi? We’ve always been fans of Bowers & Wilkins’s 600 series. Our first experience of the new range was the B&W 685 S2 standmounters, which proved a big improvement on the originals. Next up are the 683 S2 floorstanders – are they as impressive? The answer is an emphatic yes. Our expectations have been exceeded. The new 683s are seriously capable, and some of the best floorstanders we’ve heard at this price. But first, a few words on set-up. B&W has supplied plinths to fit the bottom of the speakers for health and safety reasons, in case they topple. However, we think the speakers sound better with the plinths off. Timing is tighter and fine detail is more apparent. We’d also recommend biwiring the speakers and standing them in generous space, with a little toeing in to solidify stereo imaging. It may not come as a surprise that big speakers sound, well, big. The 683 S2s are larger than many of their peers, but the sense of scale is massive. The soundstage is wide and tall, and instruments are organised with plenty of room to breathe. There’s good clarity. The performance is sharp and precise, stopping and starting right on cue. This helps to create a very deliberate vibe: music is performed with confidence and verve – we’d go so far as to say panache. Tonally they are well balanced and well integrated, but we should give a shout-out to the 683 S2s’ impressive low end. It’s deep and authoritative enough to make you briefly wonder if there’s a subwoofer hidden somewhere. And yet nothing gets drowned out by the bass. This is the kind of low-end heft we like: powerful but nuanced and controlled enough not to compromise the rest of the frequency range. For the muscle on hand, there’s a surprising level of nuance. The 683 S2s are big and bold. They grab your attention effortlessly and stir your feet, but also provide delicacy and subtlety. We’re not entirely sure how B&W has managed to achieve this stunning performance, but it’s surely due to careful engineering. There’s a new tweeter: an aluminium dome reinforced by an aluminium ring for rigidity. It is decoupled from the cabinet by a gel ring to minimise the impact of unwanted vibrations from the other drivers. It also has a protective grille (which doubles as a waveguide) these days, so it’s slightly safer from wandering fingers. Elsewhere, the twin bass cones have also been reinforced with rings of aluminium, and the FST Kevlar midrange driver has a new spider. 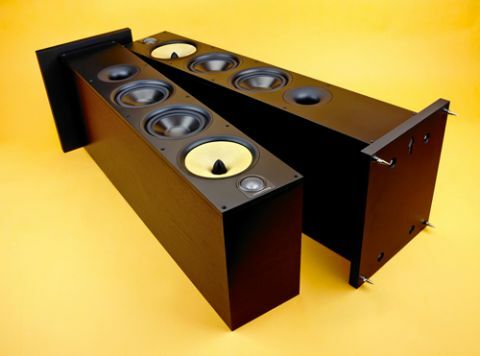 The 683 S2s are tremendously talented speakers, all things considered. We’re impressed by their power, scale and delicacy – they’re wonderfully versatile performers.